NOTE: “Empty”, “Low Ink”, “Out of Ink“, “? 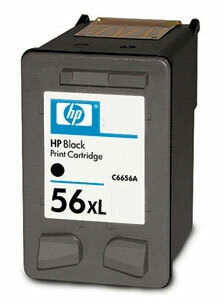 Marks“, “Counterfeit” and “Non-Genuine Cartridge” alerts are COMPLETELY NORMAL for all HP 56, 56XL, 57, & 58 ink cartridges which have been refilled! NOTE: You must first stop the blinking ink error light by pressing the Cancel button. 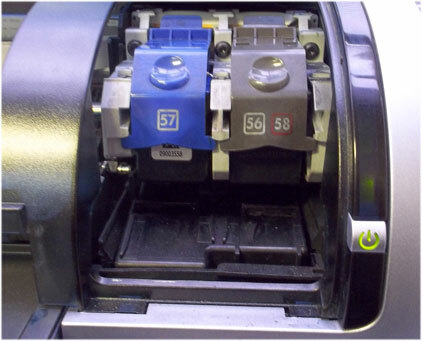 You may need to remove one of the ink cartridges first in order to do this before you can proceed, then re-install cartridge just prior to commencing the diagnostic test. To begin, Press and HOLD the Power Button. Press the Resume/Down Arrow button 3 times. Release the Power button; the Tap 43 report will print. 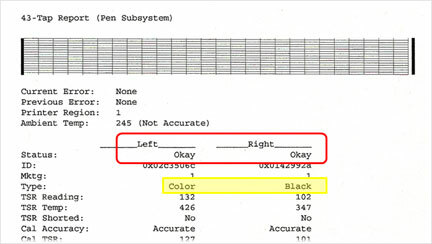 The Tap 43 test report will be printed using the black ink cartridge by default; if a blank page appears then remove the black ink cartridge from the printer and repeat steps; report will be printed using the Color cartridge. This can also help you isolate the problem to one of the ink cartridges. 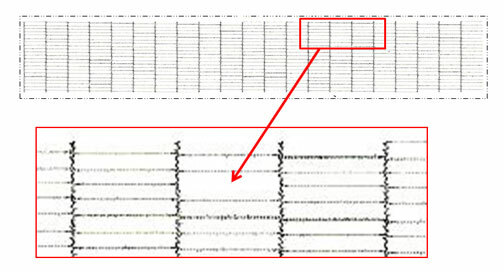 The ‘Current’ error message should state ‘None’, however if you observe errors such as….“Too Many Good Nozzles.” / “Pen in chute -open, shorted control lines” / “Wrong pen Type” / “Unknown Pen Type” / “Pen in left or right chute has Bad TSR” / “Too Many Resistors Blown or Unreachable” then a severe cartridge error condition is present and the ink cartridge may need to be replaced. The Left and Right ‘Status’ columns should state ‘Okay’. If not, then the respective ink cartridge may be electrically damaged and may need to be replaced. 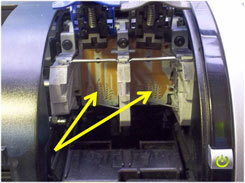 Remove and clean both ink cartridges and flex driver cables. Repeat test.